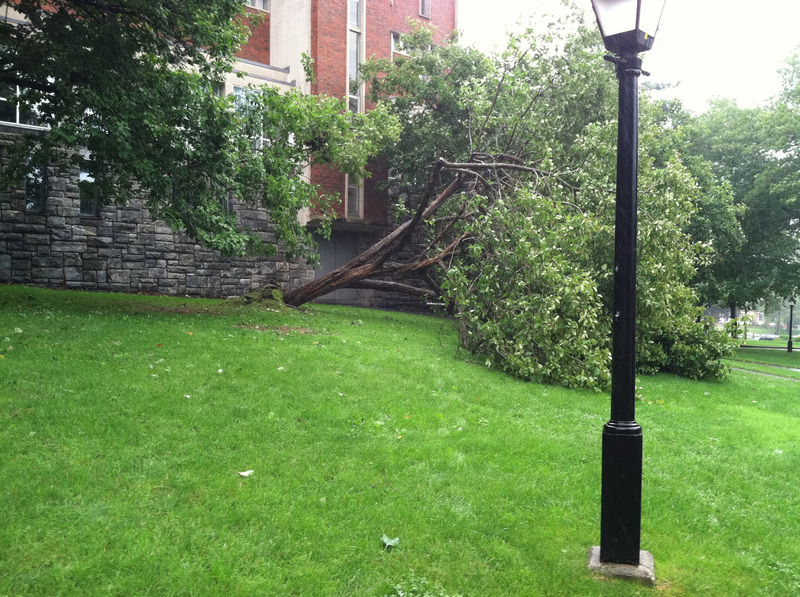 A fallen tree beside Frost Library was one of the few serious incidents caused by Irene. With the class of 2015 set to arrive on the very crest of the storm, the administration and staff were set not only to orient but also to protect the incoming freshmen from the storm of their first College days. Discussion of the impending hurricane began on Wednesday, Aug. 24, and began with only the Dean of Students Office. By Friday, a committee had been established encompassing most offices of the College, including Buildings and Grounds, Human Resources and Public Affairs. The committee joined forces with the Emergency Operations Center (EOC) to focus on ways in which to ensure everyone’s safety. According to Dean of Students Allen Hart, when the preparations began, they were aimed at accommodating the orientation programming should disruptive weather occur. Originally, incoming first-years were to register in Converse Hall, but the committee decided that LeFrak Gymnasium was a better choice because the building could house everyone without having people wait outdoors. The College continued to monitor the weather changes and meet every day as storm updates came in. “As it became clearer that there was serious threat of a hurricane, our conversations shifted to the College and safety and shifted away from just orientation,” Hart explained. With the storm gathering force and the number of calls from concerned parents growing in intensity, the College began to consider allowing students to arrive on campus before their scheduled move-in date. When the committee met again on Saturday evening, however, the hurricane was in live to envelop Amherst at around 2 p.m. on Sunday, with sustained winds of 60 miles per hour. At that point, the College decided to advise students to arrive before the storm hit. “We tried to reword the message such that it said that people not only could move in early but we were encouraging them to move in early,” said Patricia O’Hara, Dean of New Students. The committee was also forced to make a decision regarding orientation, which had been set to begin on Sunday, right in the midst of Hurricane Irene. “As much as we hated to do it…we decided to cancel orientation programming for Sunday and to close the College,” said Peter Rooney, Director of Public Affairs. The committed relayed their messages to the College community via e-mails and the school website. However, many students travelling to Massachusetts from across the country were already en route when the decisions were sent out. On Sunday morning, however, Hurricane Irene was downgraded to a tropical storm, and the committee met at 6:00 a.m. to discuss whether Valentine Dining Hall should be open for breakfast. “We decided that, because the worst of the hurricane was not going to hit town until later in the morning, we would have breakfast service at Val and tell people to stock up on food because we don’t know if there’d be food service later in the day,” Rooney said. When they met again at 11:00 a.m., the committee chose to cancel lunch and advise everyone stay inside due to storm winds and rain. But by the afternoon, the worse of the storm had passed; Val opened for dinner, and the committee decided to continue orientation programming for Monday as scheduled. Throughout the day, the College relied on Resident Counselors (RC’s) to maintain communication with the freshmen around campus in their dorms, as well as providing support to first-years during a potentially stressful event. The RC’s stocked up on food, board games and other necessary supplies for weathering a hurricane. Many of their preparations proved unnecessary, as Amherst escaped the worst of Irene. Hu’s first-year residents spent a relatively uneventful day playing games and getting to know each other. “In the end, it didn’t go that bad. [My residents] didn’t seem anxious as far as I observed.” Hu added that he was “really proud” of the fondly-nicknamed “Hurricane Class of 2015” for their composure in the face of the storm.